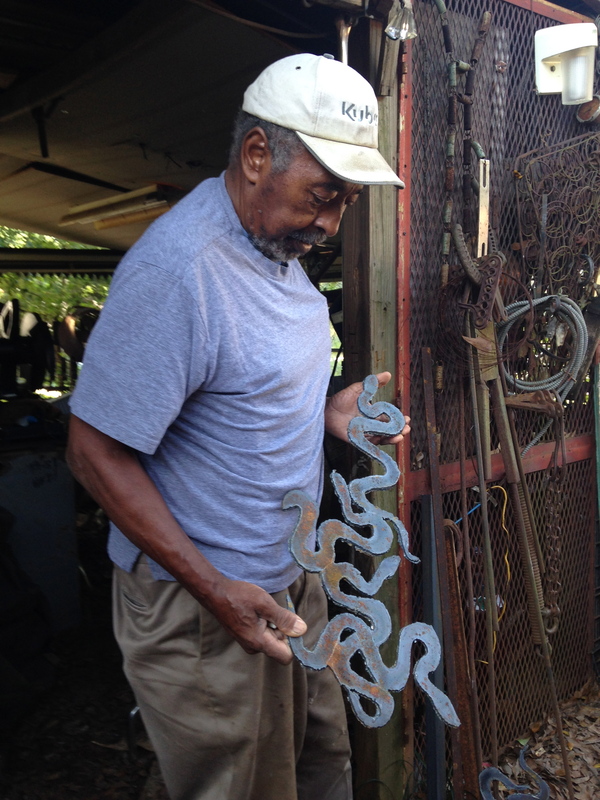 Harold Rittenberry, 83, has a unique approach to showing his work. “I don’t like to fool around with galleries,” he says. He just places them in his front yard. 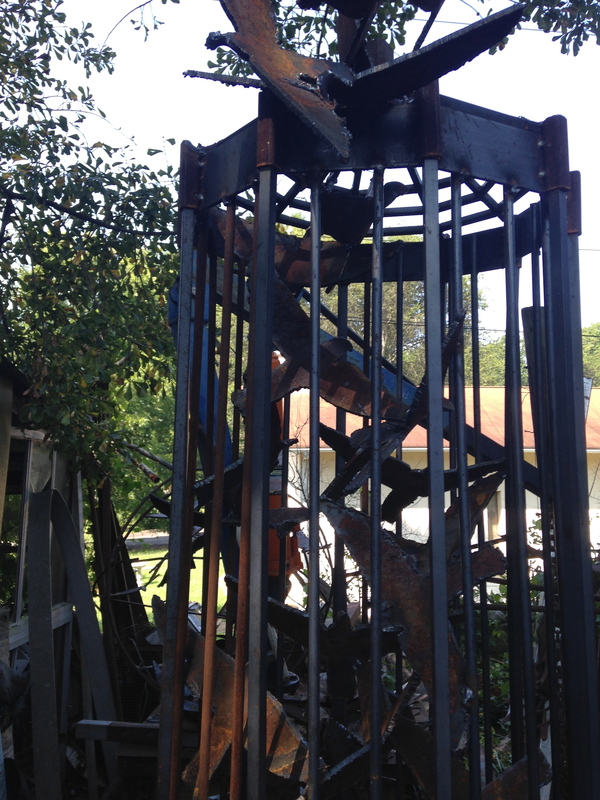 The Rittenberry Spirit Sculpture Yard is open 24/7, come rain or shine. So if you’re in Athens do stop over to the intersection of Colima Ave. and Rose Street and revel in his unique vision. It’s likely he won’t be sitting out front because he’ll be in his studio in back, working. AU caught up with Rittenberry in late August 2015 to discuss his life and work. 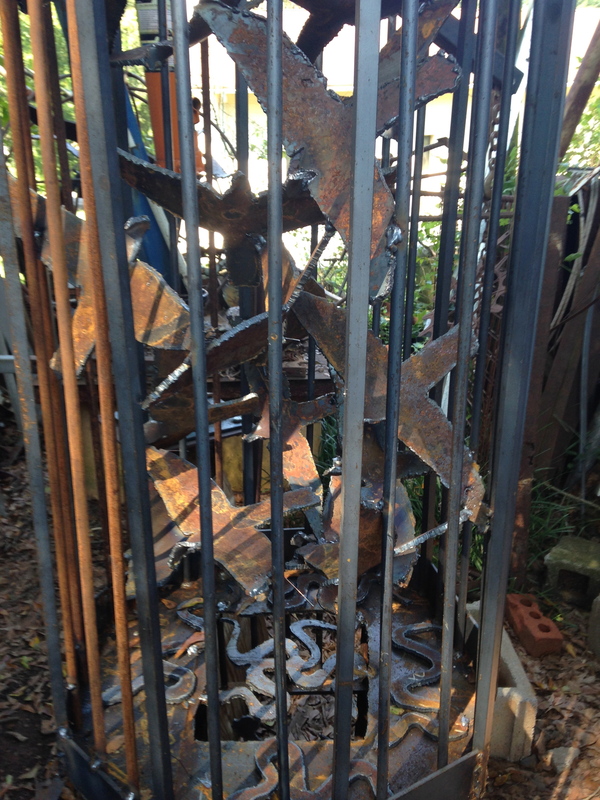 His newest creations were on full display: oversized, intimidating birdcages with a floor of metal snakes. “My Daddy did a whole lot of stone walls in Athens. And he was a carpenter. My Grandfather was a weaver. He made baskets. Or so my Mother said. I didn’t see it. My Mother could crochet. I did all kinds of stuff before I did welding. Wood carving, watercolors, other things. I gave most of em away but I sold a few. I don’t know where they are now. I got into metal in 1985. 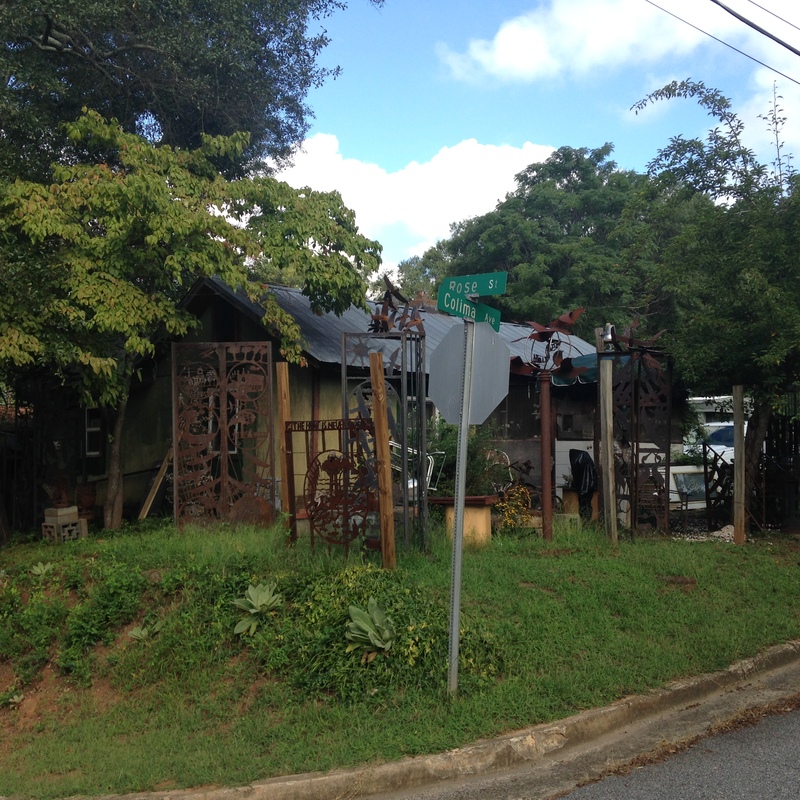 I went down to Atlanta for a while and saw some metal pieces. And I said to myself, one of these days I’m goin to get me a torch and do that. I didn’t have much money. It cost about $800 to get the thing going. 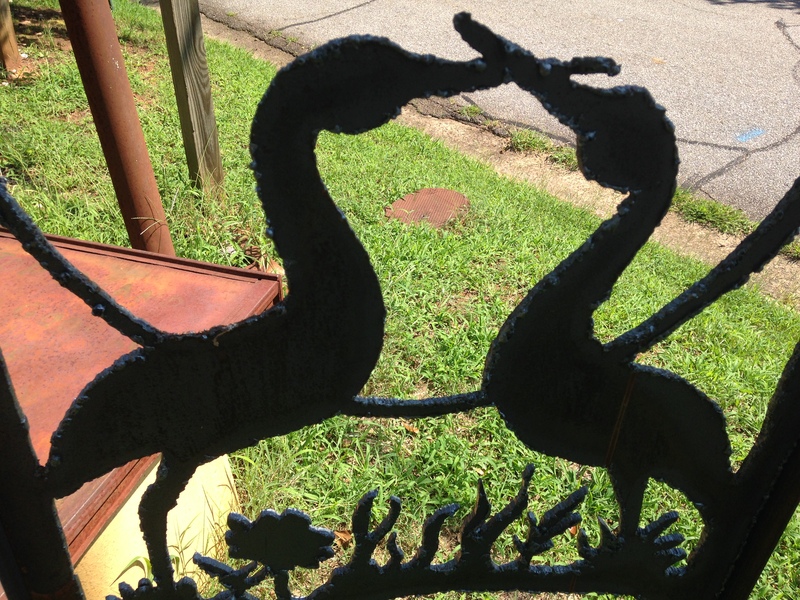 I came to do metal sculpting when my mother had Alzheimer’s. I had to have something to do. One day I went to the mailbox and there was a catalog from Sears and Roebuck. They had an acetylene welding outfit in there. So I decided to buy it and I tried to learn how to do it. The instructions were kind of complicated. I did everything I could but couldn’t do it. So I put it back into the box and was going to take it and send it back. I didn’t know what I’d do when I got done feedin my mother. So I said, I’m goin to give it one more chance. I went back out there and hooked it up and lo and behold, that wa s the chance I needed. And I learned right then how to do it – how to cut. That’s all I needed to know right there. My friend Bob Clements (UGA Emeritus Professor of Art), was the art director for the Olympics Folk Art Project, and was lookin for artists to create public art for the Olympics (1996). He knocked on my door and asked if I’d participate and I told him I would. I’d made benches before but not for public art. He was in charge of the folk art part. He said I’d like for you to build two benches. I’d made a couple of hundred benches out of plain steel but he wanted them in stainless steel. I said I didn’t work in stainless steel. You gotta have an electric welder to do it. I said I don’t have one a those. So he said, you’ll have to get one, borrow one or rent one. So I had to learn the electric welder. Stainless steel is another world, man. So I made em. They’re somewhere in downtown Atlanta now. I don’t have the teaching instinct. I don’t know. I‘d tell a young artist to go for what they think they ought to. They can’t seem to understand that they can do stuff on their own. They always think they have to be told. So I just don’t fool with nobody. I just stay to myself, if they want to learn it let em learn it like I did. I’ve never had an apprentice. I’m too proud a person for that. For me, animals mean determination. Giraffes are determination. They don’t worry about nobody carin for em. They self-sustain. Birds are messengers. They’re always flyin up. Soaring. They’re ideals. They’re new beginnings. They mean a whole lot of things. When they’re together, like in these new ones, they’re congregating; they’re having a conversation. The fish are a divine image as well. They’re energetic; they’re energy. Love is the most important thing. Love is all. Love is the most powerful thing in the world. Love is power. It’s more powerful than the atomic bomb. One piece says Love and Liberty. It’s a dedication to all the blacks in World War I. 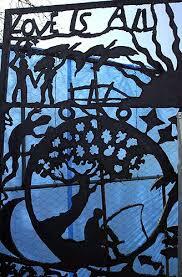 The newest one are birdcages, called Escape. I’ve made three of em. The first one’s in a hallway somewhere at the Georgia Museum of Art. 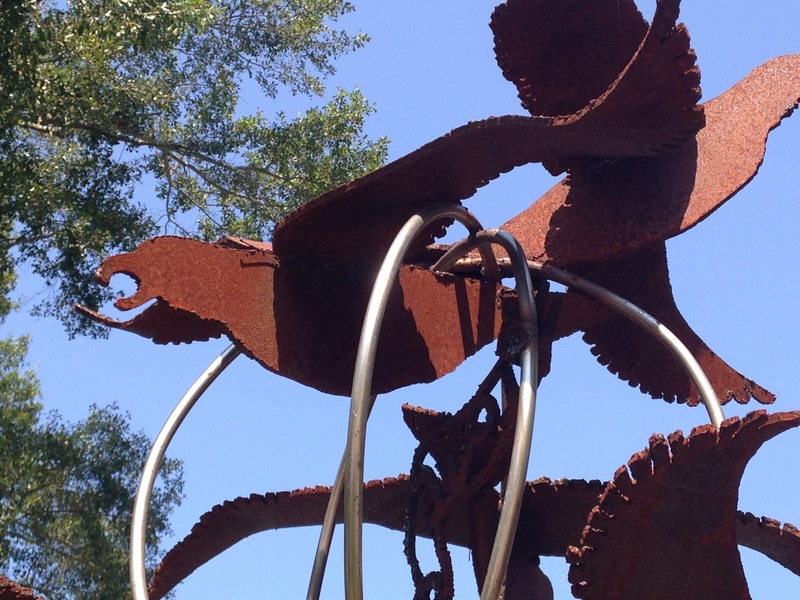 Birds escaping from snakes…tyranny, dictatorship and war. They’ve broken free and going out into the universe.